44 states and the District of Columbia have measures subjecting abortion providers to legal restrictions not imposed on other medical professionals. Unable to comply with these far-reaching and medically unnecessary laws, clinics have taken their fight to the courts. 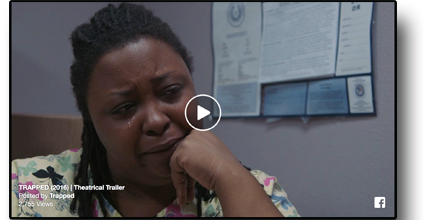 TRAPPED — the 2016 Sundance Film Festival Award-winning documentary that takes viewers to the front lines of the fight to keep abortion safe and accessible — is coming to the San Francisco area beginning March 18. On March 2, the Supreme Court will hear arguments in Whole Woman's Health v. Hellerstedt — a case that argues the constitutionality of a far-reaching Texas law that dramatically restricts abortion access.